Our vacation in sunny Florida was wonderful! Returning from a vacation is never easy for me . . . it seems like it takes forever to get back into the swing of things at work and this week was no exception! Today I was thinking . . . How do people decide what career to pursue? For some it is a matter of a skill they possess, for some their families have decided for them, and for some people it is a desire in their heart. I use to dream of growing up and running a children’s orphanage so I could nurture and educate abandoned children. (Maybe I watched too many Shirley Temple movies.) Regardless, from my experiences I have learned that appropriate discipline, hard work and having fun are all a part of learning and teaching. To me, being in the early childhood field is not only a career, but it is a quality that is imprinted in my heart. I feel blessed and fortunate to have my job. Maybe by next week I’ll be back into the routine of the daily grind?? Have you put your “Woolies” away yet? Don’t! Well not your Basic Grey Woolies that is. 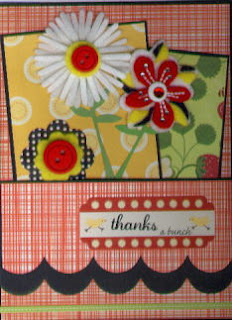 Be inspired by these cards and some others posted on the CP blog.